The Guadalupian hydrocarbon system contains the major bulk of the oil and gas reserves of the basin (figure below ) with reserves of a total of 43 billion barrels of oil and over 18 trillion cu ft. of associated gas (Daton, 1979). The Permian Basin is considered to be in a mature state of petroleum exploration with very little potential for finding further major hydrocarbon fields in the Upper Permian strata which is mainly the result of the very early over-drilling (Dalton, 1979). The largest oil fields in the basin are located within the Central Basin Platform and mainly produce from the San Andres carbonates. 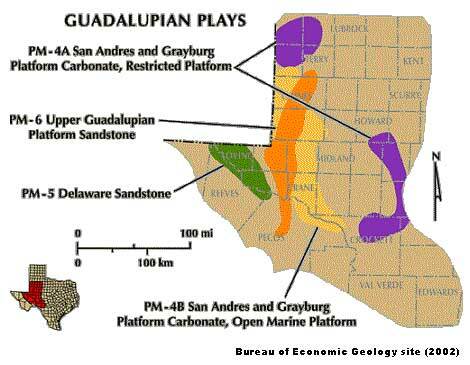 The other oil provinces of the Permian sections of the Permian basin are the Northwestern and Eastern Shelves, where production is mainly from the San Andres carbonates and dolomites, and the Delaware Sandstones. The primary lithology of the reservoirs is limestone (40%), dolomite (29%), and sandstone (29%) (Ball, 1997). 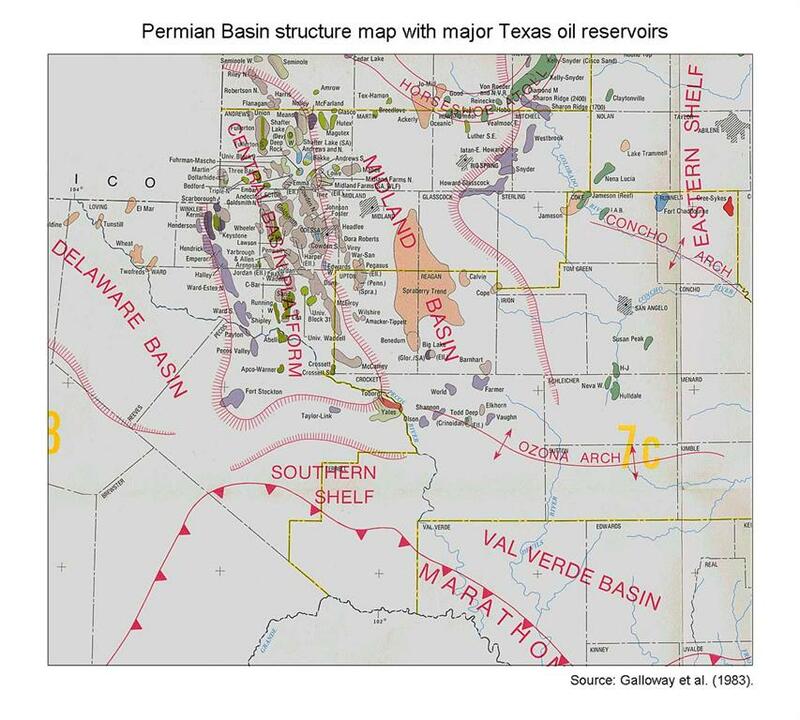 This section presents an overview of the petroleum system for the Guadalupian section of the Permian Basin and at the time of this thesis included the current state of the petroleum production, the reserves and an overview of the basin Late Permian geology in term of its source-reservoir-seal triplet. The Permian basin is an asymmetrical basin in which the deeper Delaware Basin to the west is separated from the shallower Midland Basin by the Central basin Platform (CBP). To the northwest and east, carbonate shelves bound the basin, while the Marathon-Ouachita fold belt bounds the basin to the south. Most of the hydrocarbon accumulations are in oil fields of the CBP and the northwestern and eastern shelves, with some minor fields in the Delaware Basin. Benjamin F. Shumard was the first geologist to identify the age of the Guadalupe Mountains in 1859. Later ranchers accidentally found oil and gas while drilling for water, but the first commercial oil well was completed in 1921 when oil was discovered in the eastern side of the basin. The discovery well was completed at a depth of 2,498 feet in the Westbrook field. Most of the early discoveries were based on surface anticlinal prospecting in which some major oil fields such as the Yates and World fields were discovered at shallow depths (Red River Authority of Texas, 2002). In 1928, the Hobbs Field was discovered by using the seismograph (magnetometer) and marks a turning point in oil discovery in the Permian Basin and for hydrocarbon exploration in general. In 1930, Cartwright was the first to delineate and name the Central Basin Platform. The first deep oil discovery occurred in 1928 with the gusher from Ordovician age rocks at the Big Lake oil field in Reagan County from depth of 8,525 feet. Many more oil and gas accumulations were discovered during and after World War II from rocks ranging in age from the Cambrian through Permian (TSHA, 2002). The Permian system contains over 2,000 reservoirs that contained over 45 billion BO and 18 trillion cu ft. of associated gas (statistics from 1978 by Dolton et al., (1979)). This accounts for about 65% of the total Permian hydrocarbons in the basin. In 1966, the annual production of the entire basin was 607 million barrels of oil and 2.3 trillion cubic feet of gas with a cumulative total of 11.3 billion barrels of oil produced by end of the year (TSHA, 2002). The Guadalupe strata contain the bulk of the hydrocarbon reserves stored in 2,188 pools which account for more than 40 billion BO for the basin from a thickness of 10,000 feet or less (Dolton et al., 1979). The whole Permian strata generally grade upward from clastic into evaporites in the basin and carbonates into red beds and evaporites in the shelves. Dolton et al. (1979) tied the vast hydrocarbon accumulations in the Guadalupian to the progressive development of reefs and lagoons in the Wolfcampian which culminated at the end of the Guadalupian with Capitan Reef Complex. Traps are mostly stratigraphic and these shift as depositional and diagenetic lithofacies change regionally. Reservoir porosities range from 1.5 %-25% and permeability ranges from 0.02 to 200 md, with an average recovery factor of 25% (Dolton et al., 1979). The brief descriptions provided in this chapter are based on a classification compiled by (Ball, 1995) representing the most recent public data that covers the whole basin. Please refer to left figure for stratigraphic nomenclature of the section. This plays of this area mostly contain oil with minor gas accumulations which occur in the dolomitized shallow-water carbonates and some updip platform sands with some production from the basinal facies that envelope the whole Central Basin Platform (CBP). 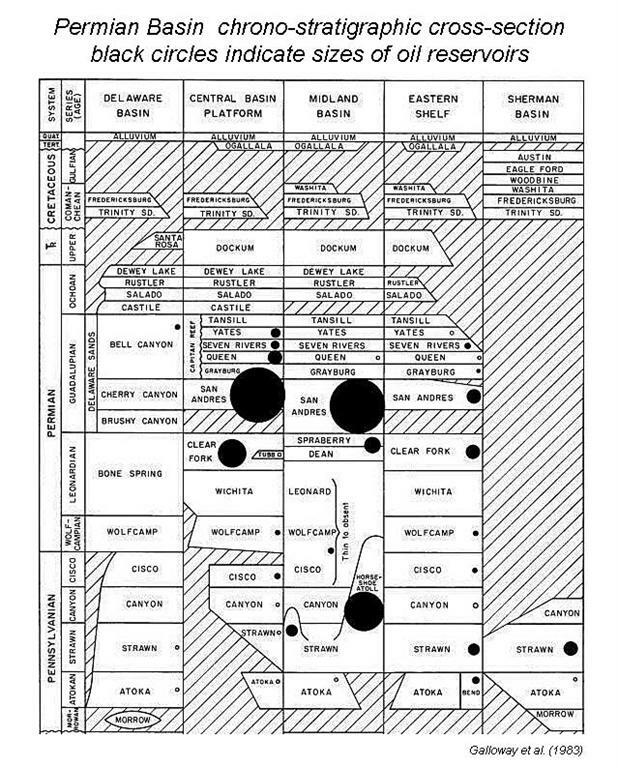 Hydrocarbon accumulations are found in structural/stratigraphic traps (Robinson, 1988). The sandstone reservoirs are interpreted to have deposited pene-contemporaneously with the carbonates that collected on the open to restricted platforms and platform margins. Reservoirs include San Andres, Grayburg, Queen, Seven Rivers, and Yates Formations (Ball, 1995). This is the most important play within the Permian basin with a cumulative production of over 11.6 billion BO and 26.7 trillion cu ft. gas by end of 1990. This play also includes the reservoirs of the Yates Field, which is the largest in the basin and was discovered in 1926. Source rocks include the organic-rich calcareous shale and shaly limestone of Wolfcampian and Leonardian age; to a lesser extent the Late Devonian Woodford shale which deposited in the shallow platform in lagoonal/marsh settings; and the organic-rich Pennsylvanian and Permian shales from the basins adjacent of the Central Basin Platform (Robinson, 1988). Hydrocarbon generation from adjacent organic-rich source rocks probably occurred in the Upper Permian (Ball, 1995). Ball (1995) stated that the reservoirs of this play consist of porous and permeable dolomitized carbonates, limestone and fine­-grained sandstone. These carbonate rocks were deposited on platforms and at platform margins. Reservoir quality was enhanced by selective dolomitization, dissolution, fracturing, and leaching. Individual reservoir thicknesses range up to hundreds of feet with overall porosities averaging 12% and permeabilities averaging 18 md. Drilling depths vary from 1,000 to 10,000 ft (Ball, 1995). Very effective seals were provided by the impervious dolomite, shaly carbonate, anhydrite, and other evaporite facies. Trapping mechanism are combinations of structural and stratigraphic features that include domes, that are associated with stratigraphic depositional and diagenetic facies changes (Ball, 1995). Fluids migrated laterally and upward into the present reservoirs. The plays of this area mostly contain oil and minor gas accumulations which occur in restricted shallow-water carbonate platform sedimentary rocks, with admixtures of siliciclastics; both lithofacies covering the northwestern and eastern shelves of the Permian basin. Hydrocarbon accumulations are found in combinations of stratigraphic, stratigraphic/structural, and structural traps of the shelf-margin and interior-facies carbonates, and are sealed by evaporites (Robinson, 1988). The carbonate reservoirs are interpreted to have been deposited on a shallow shelf and at the shelf-margin. Reservoirs include San Andres, Grayburg, Queen, Seven Rivers and Yates Formations (Ball, 1995). This is a very important play within the Permian basin with a cumulative production of over 10 billion BO and 7.9 trillion cu ft. gas by the end of 1990. This play includes the reservoirs of the giant fields of Wasson and Slaughter-Lovelland, which were discovered in 1936. Source rocks include indigenous Permian organic-rich calcareous shale and shaly limestone that were deposited within restricted shelf, intertidal, and lagoonal settings; other older sources which occur in the adjacent basins are also important. Hydrocarbon generation from adjacent organic-rich source rocks probably occurred during the Upper Permian (Ball, 1995). (Ball, 1995) stated that the reservoirs of this play consist of porous limestone, dolomite, dolomitized mudstone and wackestone, and lesser amounts of fine-grained clastics which are frequently associated with evaporites, red beds and sabkha facies. These rocks accumulated at platform edge, on the open-shelf, in the intertidal, in the supratidal, and within restricted-shelf settings associated with platform growth. Individual reservoir thicknesses range up to 1,000 ft with overall porosities averaging 10% and permeabilities averaging 6 md. Drilling depths vary from 300 to 10,000 ft (Ball, 1995). Seals are provided by the anhydrite, salt Beds, nonporous dolomites, and redbeds (Ball, 1995). This plays of this area contains oil and gas that occur in the reservoirs of the basinal facies of the Delaware sandstones where they form structural/stratigraphic traps (Robinson, 1988). These sandstone reservoirs are interpreted to have deposited in a deep-water setting as channel systems within sequences of turbidites driven by density currents. The result is that this play is also characterized by low permeability and compact, thin, and scattered and small individual reservoirs (Ball, 1995). This play contain the smallest reserves of hydrocarbons, and have a cumulative production through 1990 of 325 million BO and 1.6 trillion cu ft. gas. The mostly likely source rocks for the above reservoirs are early Permian organic-rich basinal shales found down section. This interpretation is based on the fact that the reservoir facies of this play are tight and therefore require a close by source for more efficient migration and entrapment (Ball, 1995). The major reservoir rocks are comprised of fine-grained basinal sandstone interbedded with laminated siltstone, organic-rich shale, limestone, and dolomite. Reservoirs include the Ochoan Rustler Formation and the Bell Canyon, Yates, Queen, and Cherry Canyon Formations of the Guadalupian Delaware Sands Series. Reservoir thicknesses range up to 50, ft with 20-25 percent porosity and moderate to low permeability. Drilling depths vary from 2,000 to 11,000 ft (Ball, 1995). Seals are tight silty shales and updip facies changes. Trapping mechanism is primarily stratigraphic where updip pinch-outs of channel-fill sandstone bodies occur (Ball, 1995).